Q1: Where’s the best place you’ve celebrated Christmas abroad? So, this question brought out all the humble bragging. Turns out lots of you enjoy spending Christmas away from home, and after hearing your stories we’re definitely convinced. Of course for many people there’s nothing like spending Christmas at home, but even they admit they have dreams of trying a festive holiday. Q2: What’s the best Christmas market you’ve been to? Where did you go and where would you like to visit next? We love Christmas markets even in the UK, but it always feels that little bit more magical when you’re also on holiday! You sent us some great advice about your favourite markets. Q3: Would you ever consider spending Christmas in the sun? Where would you like to visit? But we also had the snow-lovers, for whom spending Christmas in the sun feels unthinkable. Q4: Any tips for organising a cracking Christmas break? Best places to go to get in the Xmas spirit? Was there any doubt what the answer to this would be? Lapland, of course! 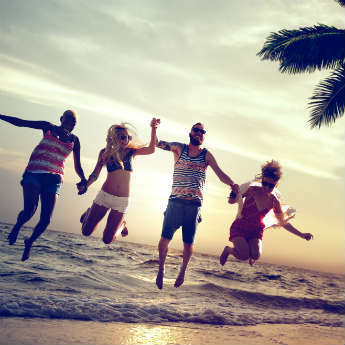 Q5: Finally, we love seeing your holiday snaps! Share a photo of you enjoying Christmas on your travels. A photo question has become a regular occurrence here on #HolidayChat – we love seeing all your holiday photos, and it’s such a fun way to end the hour! See you next month for a new year of #HolidayChat! If you have suggestions for a theme, you can request it in the comments.